So, here’s how we kept it super simple (besides not having an actual tea party at the tea party, of course). 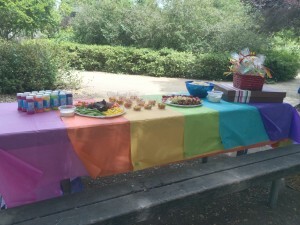 There are a variety of great online rainbow invitations. (You know, the kind that track RSVPs and let you send mass messages to attendees.) We went with Evite’s “Spectrum” and it was a great way to introduce the theme. Rainbow In My Room was actually a gift Pink received and I think it would be so much fun to have at an indoor rainbow party for little ones to ooh and ahh over. Since we were at a park with little kids, I didn’t want to plan organized games, so I can up with entertainment that doubled as décor. 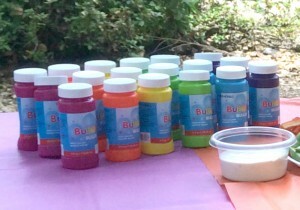 These inexpensive party-store bubbles came in a variety of colors and were great take-home favors as well. 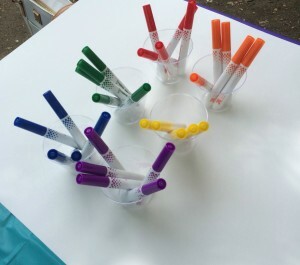 I had plenty on hand for kids and adults alike, and brought Sharpies so parents could label their children’s bubble tops (but keep the Sharpies out of little ones’ hands…trust me). 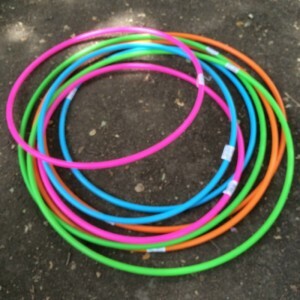 I bought a couple of each color to have nearby for kids to play with, and sent a few home with the kids who really enjoyed them. I placed a stack of white poster board on the table (which was great for a windy day, but indoors you could use easel paper like this), along with clear cups filled with rainbow-colored markers (8 red in one cup, 8 orange in another, etc., etc.). 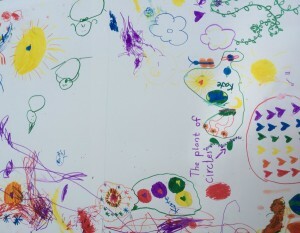 It was amazing to see little kids and their big siblings collaborating to make a beautiful picture. I kept offering kids their own sheets, but everyone preferred to sit and work together. 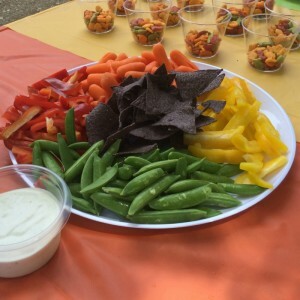 Our simple party didn’t include plates or utensils, so I prepared goodies that were perfect for toddler-sized fingers and tummies. 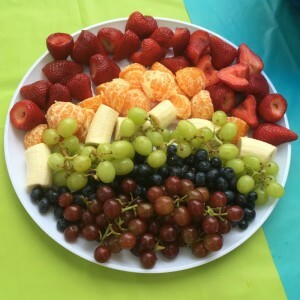 This was simply made up of whole and halved strawberries, peeled sections of mandarin oranges, large peeled banana chunks, small bunches of green grapes, blueberries, and small bunches of purple grapes. I had mini-marshmallows to make clouds, but I simplified and ditched the idea at the last minute. 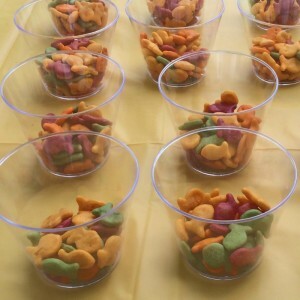 By putting kid-sized servings in clear plastic cups, the rainbow-ness was enhanced. 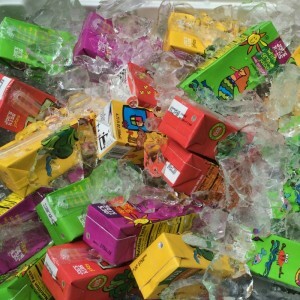 While we had plenty of mini waters on hand, we also got a variety of flavors/colors of juice boxes from Trader Joe’s. I loved how cute even the cooler looked! I really wanted to send home things that kids would get a lot of practical use out of. 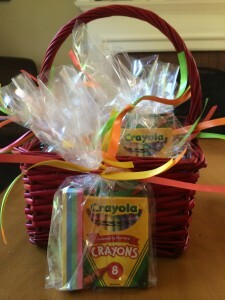 Besides the bubbles, each child got a clear goodie bag (tied with a few different rainbow-colored ribbons…though I love this rainbow ribbon) that included a small box of crayons and a piece of “rainbow” sidewalk chalk. The best part of keeping the theme playful, but simple? The birthday girl was happy. The guests were happy. And I was happy. 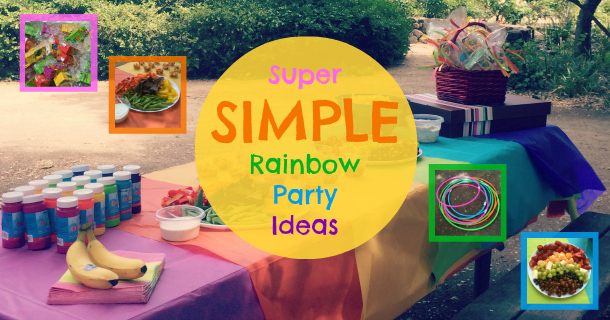 Have you thrown a rainbow-themed party? What other ideas do you have to add to the list? Disclosure: This post includes Amazon affiliate links which allow me to make a very small percentage of each sale from them. I super love this! 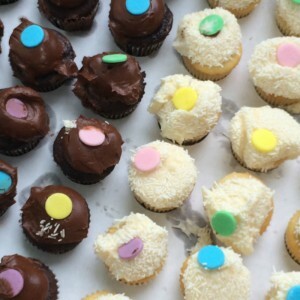 We did a rainbow/unicorn theme for Claire’s last bday…more heavy on the unicorn than rainbow though. I will have to look thru my pics to see if I have anything additional to add 🙂 I may just borrow some of these for Piper’s upcoming bday…I haven’t settled on a theme yet and am looking to keep it super simple, I always tend to go over the top pinteresty and I’m probably the only one who appreciates all my hard work (ok well…maybe Claire does too ;-)). And PS how is Reagan 3 already??!? You, my friend, are a true Pinterest guru. Rock it, because you can (and do). I simply don’t have it in me. And, yes, how do we stop the clock? 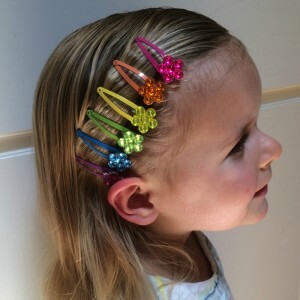 Oooh, what a cute idea! Thanks so much for adding it here.